…Urges Lagosians to be wary of fake results Accreditation and voting at the APC Gubernatorial Primaries, are yet to commence at the various centres according to the latest report by the Chairman of the Lagos Governorship Electoral panel, His Excellency Chief Clement Ebri. Distribution of electoral material to commence by 1pm today, followed by accreditation and voting which will be conducted by the APC NWC appointed officials, in order to ensure a free, fair and credible primary. Lagosians, particularly members of the APC are hereby urged to disregard reports and footages of ongoing elections in some wards in the State, as no State party official is empowered to accredit or conduct the Lagos Gubernatorial primaries. The Committee has also stated that all registered members of the party, with their membership slip are entitled to participate and are therefore urged to peacefully proceed to their various wards for accreditation and voting. By Olasunkanmi Akoni, Ebun Sessou, and Monsuru Olowoopejo Babajide Sanwo-Olu is currently on the lead in the Lagos gubernatorial primary elections conducted by the All Progressives Congress, APC, on Tuesday. He is ahead of the governor of Lagos state, Mr. Akinwunmi Ambode, our Correspondents said. 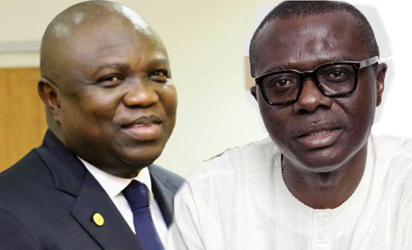 Ambode and Sanwo-Olu Below are some unconfirmed results coming in across wards: At Sanwo-Olu ward E3, he polled 45, 000, while Ambode scored 0. Babajide Sanwo-Olu at Ward C Ikeja, Tinubu’s ward, Sanwo-Olu recorded 946 votes, while Ambode recorded 4 votes. Also at Ward E Agege LG, Speaker Mudashiru Obasa’s ward, Sanwo-Olu polled 492 as against Ambode who has no vote. In ward C2 Alimosho LG, Sanwo-Olu scored 16, 724 as against Ambode with 3 votes. Similarly, at Mushin LG 1,Ward 2, Sanwo-Olu secured 4,011, as against Ambode’s 5 votes. At Kosofe LG, Wards C, D, E and F Sanwoolu earned 16,153 as opposed to Ambode’s 83. At Ejigbo Ward F5 where Ambode’s Commissioner for Information and Strategy, Kehinde Bamgbetan, hails from Sanwo-Olu polled 14, 490 votes with none recorded for Ambode. From Alimosho Ward C2, Alimosho Local Government, Babajide Olushola Sanwo – Olu scored 16, 724 votes and Akinwunmi Ambode scored 3 Votes. Ward E2 Egbe idimu SAWO :10,000. AMBO: 29, In Kosofe Ward D, Sanwo-Olu: 4,800, Ambode: 1,700. Mushin 1,Ward 2 Result SANWOOLU – 4011 AMBODE – 5 Total number of votes in kosofe LGA, Wards C, D, E & F, Sanwoolu 16,153, Ambode 83 In Ward C2 Alimosho Local Government, Sanwo -Olu scored 16724, Ambode scored 3 Votes. Lagos APC primary: Ambode defeated in Badagry Governor Akinwunmi Ambode of Lagos State lost in Ward B, Apa, in Badagry Local Government Area of the State to his main rival, Mr Babajide Sanwo-Olu during the governorship primary of the All Progressives Congress, APC. Mr. Sanwo-Olu scored‎ 3070, while Governor Ambode scored zero at the end of the exercise in the Apa Ward.